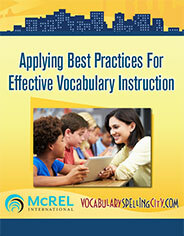 VocabularySpellingCity has released a special report titled “Applying Best Practices For Effective Vocabulary Instruction.” The report, written in partnership with McREL International and released on August 12, 2016, describes the challenges schools face in implementing literacy programs effective in vocabulary building and retention, and how those challenges can be overcome using programs such as VocabularySpellingCity, which applies research-based word study techniques to provide effective practice. For decades, educational researchers have sought to identify the factors most critical in attaining literacy and overall academic success. Studies have consistently confirmed that strong vocabulary is fundamental to reading comprehension, and to all learning. A National Research Council report found that in fourth grade, 70 percent of faltering reading comprehension was due to limited vocabulary. But how to provide teachers, already overwhelmed with myriad challenges, the tools to deliver successful vocabulary instruction for a diverse, multi-level student group? Students get immediate feedback during practice and after assessments, allowing them to work independently and take responsibility for their own learning. “We’ve been developing an understanding of how to dramatically improve students’ vocabulary skills,” said John Edelson, VocabularySpellingCity’s president and founder. “A central problem we see is that, while teachers do teach effectively, they do it under enormous pressure to cover a lot of material in a lesson-per-week routine that does not include the spaced practice necessary for vocabulary retention. The report outlines research-based word study practices, and how VocabularySpellingCity supports them. The report can be downloaded for free at www.spellingcity.com/vocabulary-study.html.